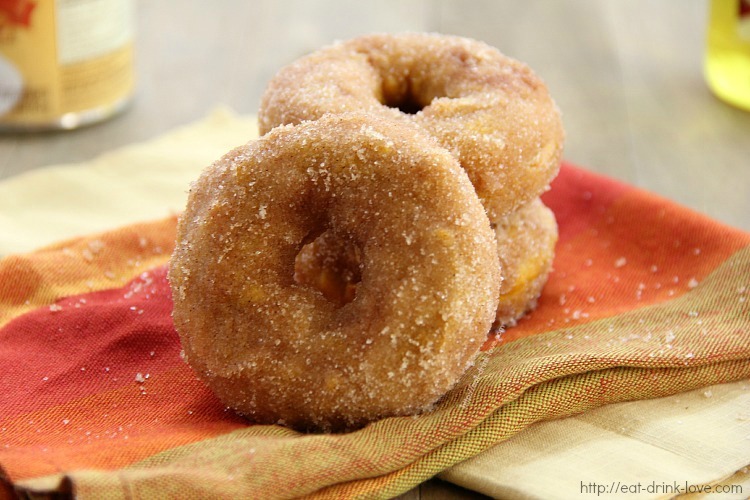 Baked Pumpkin Doughnuts - Eat. Drink. Love. Doughnut vs. Donut. Which side are you on? I’m not really on any side. I like donut because it is short and sweet, but then the OCD Spelling Nazi in me says it should be doughnut. 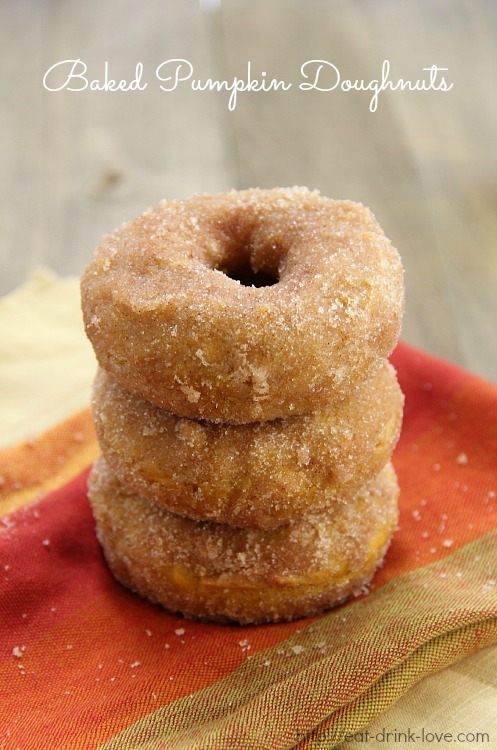 Seriously, whatever you want to call it, these pumpkin doughnuts are so good! I feel like I have been baking non-stop lately. Having so many baked goods in the house is not good, people. Luckily I have co-workers who are more than happy to eat up any goodies I bring to the lab. Even though I have been doing too much baking, I could absolutely not say no when the folks over at STAR asked me if I wanted to try their newest olive oil, Butter-Flavored Olive Oil! I mean, buttery olive oil?! Yes, please! And even better, by swapping out regular butter for this great olive oil, you will also save yourself some calories and saturated fats! When I got the olive oil, I started thinking about what I could do with it. My first thought was to go for some type of potatoes or meat, but I wanted to try it with baking instead as olive oil is not a common ingredient in baking. Though there is not any butter in this recipe, the butter flavor still shines through thanks to the olive oil! I covered my doughnuts in a light cinnamon sugar coating, but if you want to cut the sugar so they are healthier, the doughnuts will still be delish without the coating! I know some of you are still not ready for pumpkin season, but it’s certainly started for me! 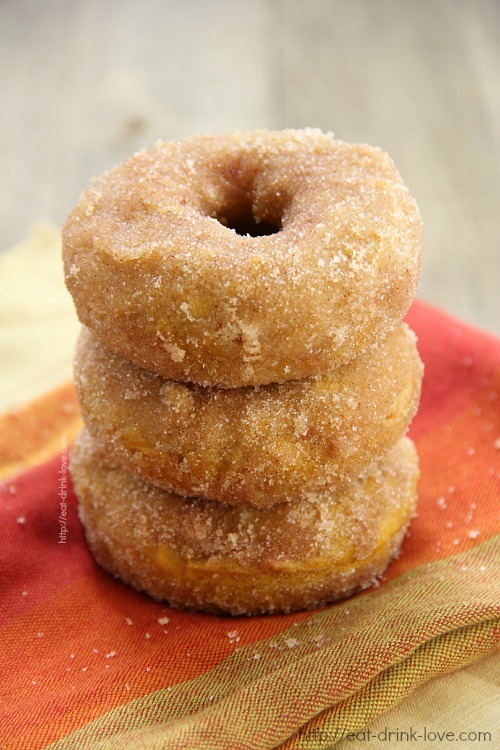 These baked pumpkin doughnuts are so simple, but still oh so perfect! Soft and full of fall flavors, you won’t miss the fried version! Preheat oven to 350 degrees F. Spray a doughnut pan with non-stick spray. In a mixing bowl, stir together the flour, baking powder, salt, cinnamon, nutmeg, allspice, and cloves. In a separate, larger bowl, stir together oil, brown sugar, egg, vanilla, pumpkin and milk until smooth. Add dry ingredients in with the wet ingredients and mix until just combined, being careful not to overmix. Spoon the batter into each cavity of the pan. Bake for about 10-15 minutes or until a toothpick inserted comes out clean. If you want to do a cinnamon sugar coating, melt about 6-7 tablespoons of butter (or use more of the butter-flavored olive oil!). 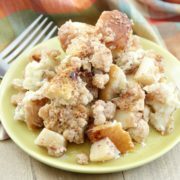 In a separate bowl, stir together about 2/3 cup sugar and 2 tablespoons of cinnamon. 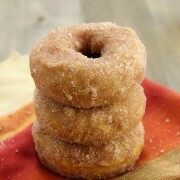 Dip each doughnut into the butter until completely coated and then dip into the cinnamon and sugar. Repeat with each doughnut. If you want to pick up a bottle of STAR’s Butter-Flavored Olive Oil, they have made this handy conversion chart! 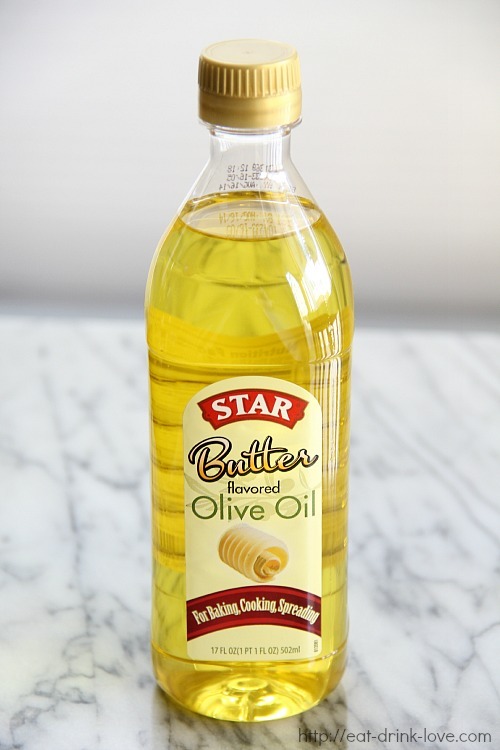 Disclosure: STAR contacted me to ask if I would try their new butter-flavored olive oil and use it in a recipe. All photos and comments in this post are my own opinion. I love making baked pumpkin doughnuts. Probably one of the tastiest because the pumpkin keeps them moist in the oven. The oil is intriguing. Oh, looked at those gorgeous donuts. Thank you so much for introducing me to butter flavored olive oil, sounds good. Have to go shopping for that. pinning. I always go with donut but that’s because it’s shorter : ) Laziness! 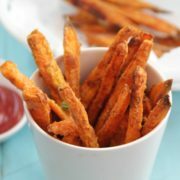 These pumpkin ones sound great! I really like that they’re baked … and with butter olive oil? And of course I would use that cinnamon sugar coating. Yum! Oh pumpkin doughnut time! Hello Fall! I am a doughnut gal just because it seems so much more grown up. Donuts remind me of Dunkin Donuts. These are much more special. Donuts are my kryptonite! I love them so! These pumpkin ones look to-die for. And that oil! Duuuuude. You can just use vegetable oil! Yes, 1:1 ratio. I’m not sure I would use extra virgin olive oil. I used olive oil because it was butter-flavored so it would be good for baking. If you want to use EVOO, I would make sure it is light in color. Darker oil will give off a stronger taste and I can’t tell you whether or not they would be good. EVOO is really best for cooking, but you could give it a try. Tammy, the butter olive oil is only at Walmart right now. You can check for the store nearest you with it in stock at : http://www.walmart.com/ip/Star-Butter-Flavored-Olive-Oil-17-fl-oz/28891923. Extra Light Olive Oil is also great for baking as it doesn’t have the strong olive taste like EVOO. 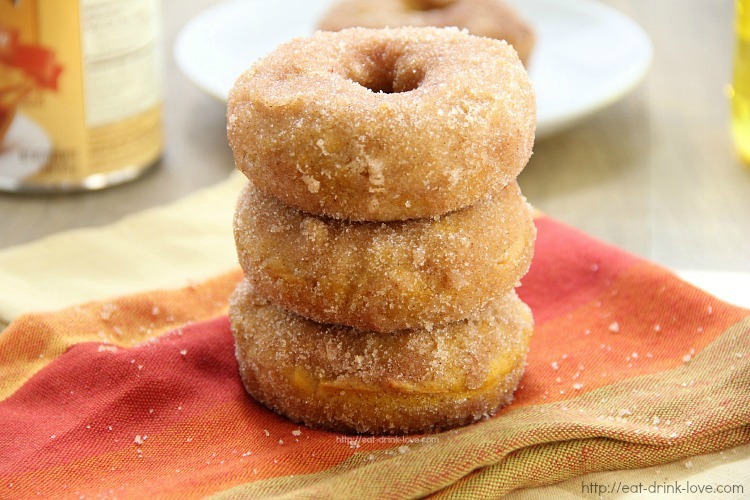 I’m excited to try this recipe because pumpkin doughnuts are one of my fave pumpkin treats, but I don’t have a doughnut pan. Could the batter be piped in circles & baked? Obviously they’d be flat on the bottoms, but I didn’t know what the consistency of the batter is, if it would hold shape enough to pipe it & bake it or not. Or would it be better to just put it in mini muffin pans to make more like a doughnut hole? You could pipe the batter, but it may end up spreading in the middle and you will lose the doughnut hole. 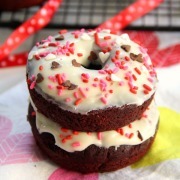 You could certainly make these into doughnut holes or even doughnut muffins! Any idea of the nutritional information per donut? Pingback: 25 Perfect Recipes to Make for Halloween - Eat. Drink. Love.